A trip with the neonatology critical care transfer team. Horrible weather, bad roads, poor visibility, agitated driver, blaring siren. Nice and warm inside the ambulance, terrified new intern busy reading up on resuscitation. 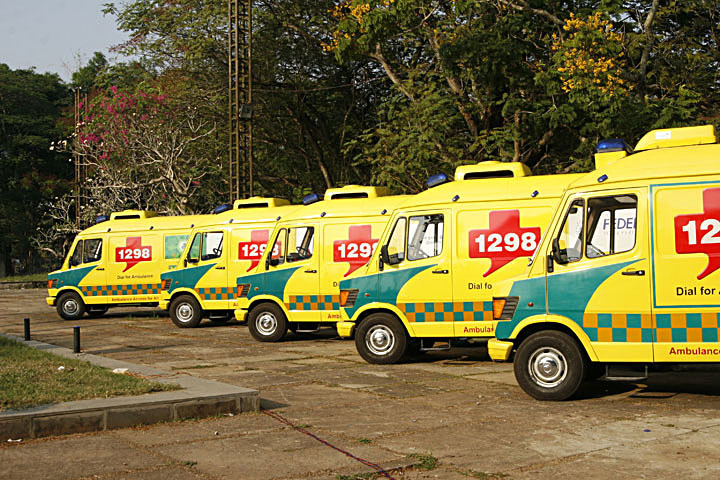 Bored, random thoughts on the emergency medical services back home in India. Or the lack of them. The telephone directory at home has a list of numbers to call in any emergency. Police, fire force, ambulance service… There is no universal number like 911. Each service has its own three digit number, which is easy to remember – 100 for the police, 101 for the fire force. Yet I can’t tell you without looking if I call 102 or 103 for an ambulance! Surely that has to be the one that’s more often used? You’d be surprised. You can call the police if you’ve been mugged and they’ll show up in a few minutes, but God help you if you’ve had a heart attack! Here’s how EMS worked in India – for a very long time. Every city or town council had ambulances and drivers on its payroll. When you called for an ambulance you usually got one, but it was really just a ride to the hospital. The driver did his job – drive. He had absolutely no emergency training and wouldn’t know a cardiac arrest if it bit him on his private parts, but he could drive like a madman. But then so could we all; only the fittest survived on Indian roads. You Gave Way To The Bigger Vehicle – that was the only traffic rule that you had to know. By the way, that’s pretty much still the case in most cities in India and has confused many an international tourist. Check out the latest addition to ‘driving in India’ on YouTube. The terrified hand holding the camera is most likely that of a brick-defecating traveller. Things have changed. Slightly. Now most major cities have privately (read ‘corporate social responsibility’) funded EMS, managed by organisations like the Rotary or the local Red Cross. Their ambulances have trained EM nurses and technicians, resus and communication equipment. You may have to pay for their services and more than one EMS in your city will mean more than one phone number to remember. But at least it’s a start. Then there are critical care ambulance services run by major hospitals, usually under an understanding with the local councils or the police, who will alert them to an emergency. While some hospitals see this as an altruistic service, more often than not these trips end at the hospital that runs the service, even if that means bypassing three perfectly capable institutions on the way. All ethically correct, of course – you’re not soliciting these patients; you’re just providing a much-needed and socially acceptable emergency service. Unless the poor man under the truck happens to be a homeless bum and looks like it. Then time suddenly becomes of immediate essence and the EM personnel will deliver him to the nearest available EM department. He’ll probably get some first aid and an IV drip or two in the EMD, at best an ET tube and an Ambu bag, till he’s transferred to a public-funded hospital, which cannot refuse anybody, the poor sods! A little by way of explanation how the health care system runs in India. Most hospitals in India are privately run and the patient or his insurance pays for treatment. But the government runs a parallel chain of hospitals, Primary Health Centres, District Hospitals and Tertiary Care Referral Centres, besides Specialized Centres for oncology, neurosciences and so on. All good on paper, and to give them their due, they do sterling work with the kind of resources allotted to them. But these good doctors and surgeons have to deal with a huge backlog of work, are paid a pittance compared to their counterparts in the private sector and are expected to work miracles in substandard surroundings bursting at the seams with patients. Their patients can’t afford private care or pay insurance premiums and hence are doomed to ‘inferior’ health care. Emergency care is afforded the least priority in these institutions. Privately funded hospitals, in contrast, are part of a booming, fast growing and lucrative industry. They have all the latest equipment, good nursing and intensive care, paramedical services and expert physicians and surgeons. They also have efficient public relation departments that will see that you have adequate insurance cover before they lyse that thrombus in your coronary artery. A few concerned doctors in my city tried to make a difference to this system, a little before my time, by starting the Trauma Life Support Society of India, whose ambitious aim was to co-ordinate EMS among the various private hospitals. Their ambulances would deliver the patient to the nearest ‘member’ hospital which would provide primary trauma care and transfer him to a speciality centre for further treatment. In order to standardize protocols, the society proposed to, and in fact still conducts, trauma life support courses for doctors and nurses. But, as far as I am aware, the project has reached a kind of stalemate in its main aim. Every other hospital in the city has specialized departments and doctors on call. Ultimately it’s a question of money, honey. And of inflated medical egos. Of course relationships exist between different hospitals. Sure, emergency services in India have to be more organized and streamlined. But that will happen only when the government takes some initiative. Sadly that seems a distant priority as long as lives are seen as expendable in the world’s most populous democracy. We in the medical profession can only do our best. And live in hope.